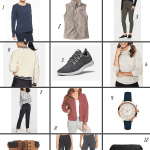 This gift guide is for the casual and athletic (athleisure) fashionistas in your life – meaning people who like good quality threads, activewear, functional apparel, and are looking to be comfortable yet stylish. Of course fashion is very subjective and each person has their own style. Even though my degree is in fashion design, I’ve never been that person into the high-end fashion designers. Nothing wrong with that if you are, but for me it’s always been about fabrics, comfort and detailed design that makes for a unique style. 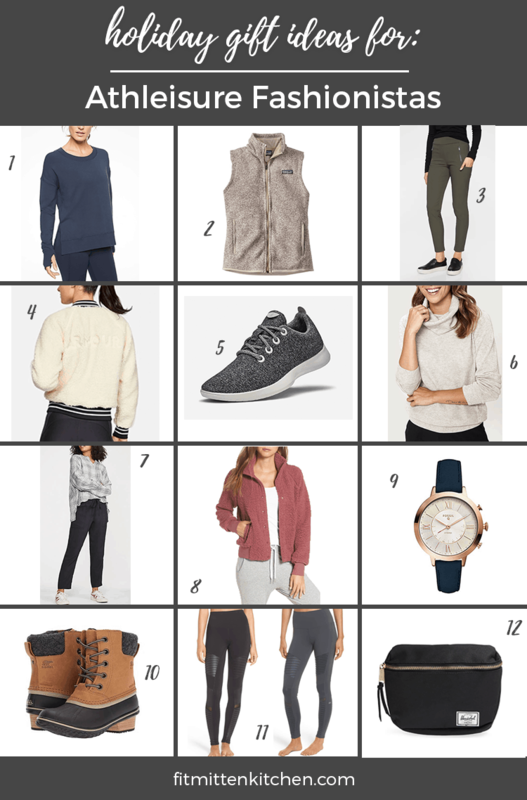 So I thought I’d round up some of my favorite quality brands and pieces for the athleisure loving ladies in your life that would make for the perfect gift this holiday season. This post contains affiliate links. If you make a purchase through said links, I will receive a small commission. Thank you for helping to support Fit Mitten Kitchen! Easy to dress up or down, which is why I love pretty much all of Athleta’s clothing line. Don’t forget instructors and trainers can get a 30% discount! Anyone else hate wearing “real” pants?! I know I am not the only one. While I have been investing in some Madewell Jeans, you can’t beat elastic waistbands for comfort. Athleta carries tons of practical yet stylish bottoms. I also have these which I love for warmer weather. I keep seeing this jacket on Instagram and it kind of makes me want it. It looks so cozy! I have personally had these on my list for months. I always hear amazing things about these shoes! Lole is another activewear brand I love – their quality is awesome and this sweater is simple with detailed stitching. plus extra 40% off sale styles! I have a pair of Lou and Grey joggers that I could wear every day. I keep seeing these sherpa style jackets everywhere and the fomo is real. Another cozy must. If you’re not a fan of the digital watch look but want some smart features, this watch is the perfect solution. Another classic winter wardrobe item. There are tons of style but these ones with the heel are nice to dress up a little bit! Everyone needs a pair of leggings you can workout in but also dress up, right? The fact that I am including a fanny pack on a 2018 gift guide makes my 90’s kid heart happy. That is all. PS. If you’re the type of person who always wants the best deal, use the app “Earny” – it will automatically track your purchase and reimburse you the difference. What’s your favorite Athleisure brand?